Happy Thanksgiving! Hope those of you in the U.S. are enjoying a great holiday weekend. My house is full of family and friends this weekend so I am taking it easy, but I wanted to share this deal with you: Take an Extra 30% Off Any Book on Amazon through 11/30. It is limit one and a $10 limit but this is a rare offer on Amazon and one I didn't want to pass up. I bought a book of fairy tales, no surprise, The Complete Russian Folktale: v. 4: Russian Wondertales 2 - Tales of Magic and the Supernatural if you really want to know. It's on my wishlist and I expect the price will go up again soon, just as it jumped from $18.34 to $108.69 for An Anthology of Russian Folktales this week. ▪ To use this promotion, you must enter "HOLIDAY30" at checkout under the "Gift cards & promotional codes" section to receive 30% off any ONE (1) book purchased in your order (up to $10 promotional credit). ▪ This offer is only valid on print books. Excludes Kindle eBooks and Audible Audiobooks. ▪ The promotion is valid for a limited time only, from November 26, 2014 at 9pm PST to November 30, 2014 at 11:59pm PST. Amazon reserves the right to modify or cancel this offer at any time. ▪ Offer only applies to products sold and shipped by Amazon.com. ▪ Limit one promotional code per customer and account. ▪ The maximum benefit you may receive from this offer is $10. ▪ Offer good while supplies last. ▪ Offer is non-transferable and may not be resold. ▪ The offer discount will be allocated to the highest priced book in your order. ▪ If any of the products or content related to this promotion are returned, the value of the offer will be subtracted from your return credit. ▪ This promotion may not be combined with other offers, including promotional certificates. ▪ Items must be purchased in a single order and shipped at the same speed to a single address. ▪ If you violate any of the Terms & Conditions, the promotion will be invalid. ▪ Shipping charges may apply to discounted and free promotional items. ▪ Offer does not apply to Amazon Gift Cards. New Volkswagen Touran with specific safety pack for children. Cress (The Lunar Chronicles) by Marissa Meyer is on sale for $2.50 for ebook format for a short time. This is the third book in this fairy tale science fiction series--one of the biggest fairy tale literary hits of recent years--and the first time this book has been on sale. It has been $8.99 most of this year since its February release date. The first book in the series, Cinder (The Lunar Chronicles Book 1) , is usually priced at $2.99 these days to help introduce readers to the series. The second book, Scarlet (The Lunar Chronicles) , is $6.99. Of course, loyal fans are most excited that we are only a few months away from Fairest: The Lunar Chronicles: Levana's Story , the fourth book in the series that will be released on 1/27/15. In this third book in Marissa Meyer's bestselling Lunar Chronicles series, Cinder and Captain Thorne are fugitives on the run, now with Scarlet and Wolf in tow. Together, they’re plotting to overthrow Queen Levana and prevent her army from invading Earth. Their best hope lies with Cress, a girl trapped on a satellite since childhood who’s only ever had her netscreens as company. All that screen time has made Cress an excellent hacker. Unfortunately, she’s being forced to work for Queen Levana, and she’s just received orders to track down Cinder and her handsome accomplice. When a daring rescue of Cress goes awry, the group is splintered. Cress finally has her freedom, but it comes at a higher price than she’d ever expected. Meanwhile, Queen Levana will let nothing prevent her marriage to Emperor Kai, especially the cyborg mechanic. Cress, Scarlet, and Cinder may not have signed up to save the world, but they may be the only hope the world has. Today's toy post includes the Goldilocks and the Three Bears Toy House and Storybook and two other sets by the same company. For some reason, I really like these. If I were still working in my old library, I would be tempted to buy these and set them up in a glass display case so I could watch the children and adults hover around them for weeks. I did that with Harry Potter Legos back in the day which were a big hit. And then later I would have them at home to play with. Because for some reason these make me want to sit down and play with them. I may have to get a set to share with my youngest nephews and niece over the holidays. They'd probably like Goldilocks best but for some reason the Hansel and Gretel one is very appealing, too. Oh, really, I like all three. Maybe Santa will bring me a set. Two years ago Santa brought me the Melissa & Doug Deluxe Three Little Pigs Play Set Soft Baby Toy , so I definitely choose one of the other sets instead although I like all three of these too much. Bring the classic story of Goldilocks and the Three Bears to life with this darling play set. Start by reading the included storybook and then build the Three Bears' house and furniture. Use the Baby Bear, Mama Bear, Papa Bear and Goldilocks dolls to act out your own version of the fairytale. The Goldilocks and the Three Bears toy house includes a working swing and a tree house for Baby Bear. Each bear has its own bowl of porridge, chair and bed. The side of the toy house folds in half to make a swimming pool and there are many secret animals hidden in the artwork all over the tree. The toy house and furniture assemble by pressing tabs into tab holes. No tools or screws required. And, all of the pieces store flat in a small carrying case. Made from EVA foam and cardstock. For ages 3 to 6. 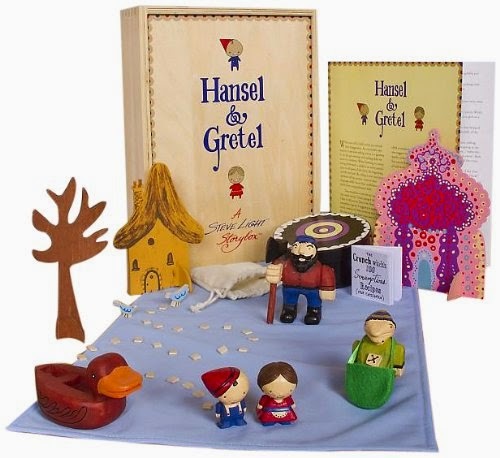 Bring the classic story of Hansel and Gretel to life with this darling play set. Start by reading the included storybook and then build the Witch's gingerbread house and furniture. Use the Hansel, Gretel and Witch dolls to act out your own version of the fairytale. In addition to looking delicious, the Hansel and Gretel toy house includes a candy garden that children can plant, a chocolate bar staircase that leads to a treasure loft. And, it wouldn't be complete without the Witch's oven! The toy house and furniture assemble by pressing tabs into tab holes. No tools or screws required. And, all of the pieces store flat in a small carrying case. Made from EVA foam and cardstock. For ages 3 to 6. Bring the classic story of the Three Little Pigs to life with this darling play set. Start by reading the included storybook and then build the three little pigs' houses and furniture. 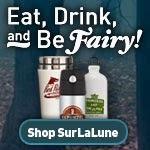 Use the pig and wolf dolls to act out your own version of the fairytale. The Three Little Pigs houses come together to make a fun and exciting neighborhood to play in! The straw and stick houses are designed to "blow down" easily while the brick house stands strong. The wolf actually fits down the brick house chimney, only to land in a pot of boiling soup. The toy house and furniture assemble by pressing tabs into tab holes. No tools or screws required. And, all of the pieces store flat in a small carrying case. Made from EVA foam and cardstock. For ages 3 to 6. Many of you enjoyed the Once Upon a Time... by Studio C I posted in the spring. Now they have a spoof on Rapunzel that had the SurLaLune hubby laughing. "Put it on the blog," he said. So I did. Enjoy! There are some big price drops this week on a few seasons of Grimm. Grimm: Season 2 is currently $13.00 and Grimm: Season 3 dropped to $19.99 from $29.99 this morning. (Or that's what my shopping cart alerts told me.) I realize more and more people stream shows these days, but these still make great gifts if you are trying to convert a friend into a fan of the show. Or if you just prefer the DVDs for yourself. Streaming can still be frustrating with the bumps and jumps it has. And DVDs are portable to friends' houses, too. My first season set of Once Upon a Time: Season 1 (bought on sale) converted my sister and her husband to the show this year--now they are fans and have bought the later seasons for themselves since they came to the series very late. OUAT is everywhere and I feel guilty for not watching it more. I'm addicted to some other non fairy tale shows instead which will remain nameless for now. Cruel Beauty (Cruel Beauty Universe Book 1) by Rosamund Hodge is temporarily price dropped to $1.99. It was on sale for $4.99 back in May, so this is the best price drop yet. The book was released in late January and is usually closer to $10.00. This isn't even to promote the next book in the series, yet, since Crimson Bound won't be released until May 2015. The romance of Beauty and the Beast meets the adventure of Graceling in a dazzling fantasy novel about our deepest desires and their power to change our destiny. Betrothed to the evil ruler of her kingdom, Nyx has always known her fate was to marry him, kill him, and free her people from his tyranny. But on her seventeenth birthday, when she moves into his castle high on the kingdom's mountaintop, nothing is as she expected—particularly her charming and beguiling new husband. Nyx knows she must save her homeland at all costs, yet she can't resist the pull of her sworn enemy—who's gotten in her way by stealing her heart. For fans of bestselling authors Kristin Cashore and Alex Flinn, this gorgeously written debut infuses the classic fairy tale with glittering magic, a feisty heroine, and a romance sure to take your breath away. This week I will be sharing fairy tale toys for the lighter holiday week here in the U.S. To start, I am sharing these story boxes that are aimed more at classroom use but work well at home, too. What I find the most charming about them? The story choices! Hansel and Gretel is not that common in toys. Rapunzel is more common these days since Disney's Tangled but still not all that common. But even better, two lesser known tales are offered, too, the Japanese Little One Inch and the African Girl Who Loved Danger. I'll start with Guidecraft Hansel and Gretel Story Box which has the duck! Obviously, the longer version of the tales are offered here, too. Just wonderful all around. Guidecraft Hansel and Gretel Story Box. A fun new approach to a timeless tale! Playtime meets storytime! Designed by award-winning teacher, author and illustrator Steve Light, the Hansel and Gretel Story Box contains stylized characters and props, as well as a booklet that tells Steve's adaption of the German fairy tale. You can stay true to the classic tale or act out your own versions! The Hansel and Gretel Story Box will encourage confidence, curiosity, and creativity in young storytellers. Hand-painted, resin pieces include: Hansel, Gretel, the Father, the Crunch Witch, and the Duck. The wooden story box measures 8" w. x 11 1/4" d. x 3" h.
"Discover a new approach to developing early language skills and storytelling; Steve Light Storyboxes! The popular German fairy tale, Rapunzel, is now a storybox containing stylized characters and props, as well as a booklet that retells the tale in Steve's own words. Be true to the classic story of Rapunzel's rescue or add your own twist; the Rapunzel storybox will encourage confidence, curiosity, and creativity in young storytellers. Hand-painted, resin pieces include: Rapunzel, the Prince, the Witch, and the garden radishes. Other props include the tower, the ladder, and Rapunzel's long, braided hair. The wooden storybox measures 8""W x 11.25""D x 3""H. Designed by award-winning teacher, author and illustrator, Steve Light. Discover a new approach to developing early language skills and storytelling; Steve Light Storyboxes! The African folktale of The Girl Who Loved Danger involves a brave, but defiant girl who gets into a scaly situation, and eventually learns to heed her parents' advice. The storybox contains stylized characters and props, as well as a booklet that retells The Girl Who Loved Danger in Steve's own words. Be true to the classic tale or add your own twist; The Girl Who Loved Danger storybox will encourage confidence, curiosity, and creativity in young storytellers. Hand-painted, resin pieces include: the Girl, the Parents, the Villagers, and the Ancestor Bird. Also features a fabric, hand puppet Lake Monster! The wooden storybox measures 8"W x 11.25"D x 3"H. Designed by award-winning teacher, author and illustrator, Steve Light. Discover a new approach to developing early language skills and storytelling; Steve Light Storyboxes! Little One Inch is the Japanese folktale of a small boy's determination to overcome the expectations of others and defeat the dreaded Oni monster. The storybox contains stylized characters and props, as well as a booklet that retells the tale of Little One Inch in Steve's own words. Be true to the classic tale or add your own twist; the Little One Inch storybox will encourage confidence, curiosity, and creativity in young storytellers. Hand-painted, resin characters include: Little One Inch, the Princess, the Prince, the Big Fish, the Oni Monster, and more! The wooden storybox measures 8"W x 11.25"D x 3"H. Designed by award-winning teacher, author and illustrator, Steve Light.